Ballots for Turkey's presidential and parliamentary elections are pictured at a polling station in Istanbul, June 24, 2018. Turks voted on Sunday in presidential and parliamentary elections that pose the biggest ballot box challenge to Tayyip Erdogan and his Islamist-rooted AK Party since they swept to power more than a decade and a half ago. The vote will also usher in a powerful new executive presidency long sought by Erdogan and backed by a small majority of Turks in a 2017 referendum. Critics say it will further erode democracy in the NATO member state and entrench one-man rule. A man carries a ballot papers in a polling station located in a school during elections in Istanbul,Turkey, June 24, 2018. A crowd of President Erdogan's supporters chanted his name as he emerged from a school after voting in Turkey's largest city Istanbul, shaking hands with people amid tight security. 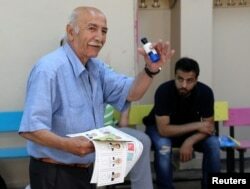 "Turkey is staging a democratic revolution," he told reporters in the polling station. "With the presidential system, Turkey is seriously raising the bar, rising above the level of contemporary civilizations." Erdogan argues the new powers will better enable him to tackle the nation's economic problems - the lira has lost 20 percent against the dollar this year - and deal with Kurdish rebels in southeast Turkey and in neighboring Iraq and Syria. Turkish President Tayyip Erdogan leaves a polling station in Istanbul, June 24, 2018. Addressing a rally Saturday in Istanbul, Ince promised to reverse what he and opposition parties see as a swing towards authoritarian rule under Erdogan in the country of 81 million people. 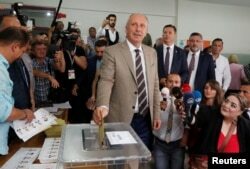 Muharrem Ince, presidential candidate of main opposition Republican People's Party (CHP), casts his ballot at a polling station in Yalova, Turkey, June 24, 2018. Erdogan told reporters voter turnout appeared good. Opposition parties and NGOs have said they were deploying half a million monitors at ballot boxes to prevent fraud. They argue election law changes and fraud allegations in the 2017 referendum raise fears about the vote's fairness. State-run Anadolu news agency said "legal action" had been launched in the southeast against 10 foreigners - French, German and Italian citizens - who identified themselves as election monitors but did not have accreditation. It was not clear whether they were in custody. 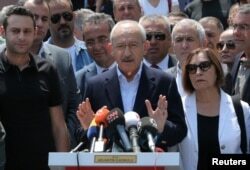 The leader of the main opposition CHP party, Kemal Kilicdaroglu, said after voting in Ankara that his party had received complaints of voting irregularities in the southeast. Kemal Kilicdaroglu, leader of main opposition Republican People's Party (CHP), talks to the media after casting his ballot at a polling station in Ankara, Turkey, June 24, 2018. "Every shadow cast over the election is a blow to our democracy. Hence it is my duty to warn all civil servants again.Please everybody do their duty," he said. CHP spokesman Bulent Tezcan told a news conference it had reported to the High Election Board (YSK) allegations of block votes being cast and of election monitors being beaten and kept out of polling stations in the southeast's Sanliurfa province. YSK chairman Sadi Guven told Anadolu it was taking steps in response to reports of irregularities in Sanliurfa's Suruc town, near the Syrian border. The government gave no immediate response to the reports, but Erdogan said there had not been any serious problems. Polls show Erdogan falling short of a first-round victory in the presidential race. He would be expected to win a run-off on July 8, while his AK Party may lose its parliamentary majority.